Don has been running for over 40 years now, and has completed 27 marathons including 3 at Boston. He’s served as a pacer for the Thunder Road Marathon for the last four years, each time bringing his group in right at the desired pace. He’s had a good bit of success, but also made about every mistake a runner can make. Marathon running can be a wonderful way to be humbled! A few years ago he completed his first Ironman distance triathlon after training twice a day for 10 months. He’s competed in a wide variety of trail runs and relays, most recently completing the New Year Eve Ultra where he covered 80 miles. This will be his sixth year coaching with the North Charlotte group, and he looks forward to building new relationships with fellow runners. The bonds of running last forever. I am originally from Venezuela but have been living in the US since 1992. I am married and have 17 years old twins. After being a couch potato for most of my adult life I started running on March of 2007. I started with a walk/run training program and ran my first 5K in April 2007, that year I ran few 5Ks, a 10K and a 15K and my first half marathon (Thunder Road) on my birthday. As a challenge in 2008 I decided to train and run a Full Marathon. I signed up for the Marine Corps Marathon and joined the Run Far (former USA Fit) Training group. The training was very challenging and demanding, the overall experience was excellent, I met many people and made a ton of new friends. I have now completed 8 Full Marathons and 13 Half Marathons. This is my fourth year as part of the Run For Your Life University coaching group. I am looking forward to helping other people reach their goal of running a marathon and help each one of you enjoy the emotional rewards that come from crossing the Finish Line. 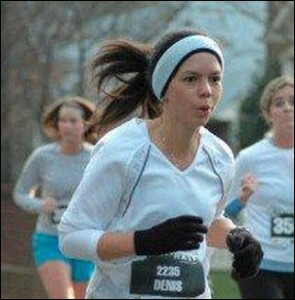 In 2010 Jess started running to get in shape for her wedding and never stopped. Six years later she’s still hitting the pavement and trails and has five marathons and a handful of half marathons under her belt. One of the things that she loves about running is the fact that her body and mind are constantly being pushed to new limits. Running has brought a feeling of accomplishment, peace, and completeness to Jess’s life. So when she was asked to help the coaches at RFYL this summer, she was so excited to help other runners reach their goals! Laurie has been part of this organization for 5 years, and coaching now for 3 years. She is such a proponent of this program and loves everything it offers to runners! Laurie has a passion for helping new and experienced runners meet their goals, whether it be completing a full or a half marathon, or just improving their ‘personal best’. She has been running for 12 years and started training for distance races in 2009. Since then she has completed 3 marathons and 7 half marathons. Her favorite thing about running is the friendships made over the miles and celebrating the milestones of each runner as the miles increase over the training season. She’s a Carolina girl, moved to Charlotte 17 years ago from Winston-Salem, graduated from UNCC, and earned her MBA from Argosy University. Besides being an avid runner, she wears many hats, including her daytime job as a College Director, volunteer at church, wife to Chris, and mom to Sam (2). 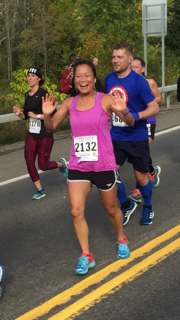 Laurie is happiest when she is running and helping others meet their goals! Coach Amber is a bona fide, trained dancer and has enjoyed the fruits of that activity her entire life. 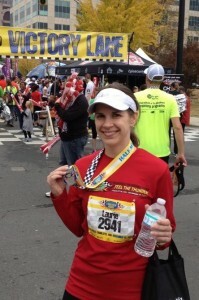 After finishing Graduate School, she looked for ways to resurrect her dancer body and began running in 2009. She didn’t exactly revive the same treasured physique, but discovered instead a new, healthier lifestyle and, even more importantly, a support system of some of the best runners and friends one could ask for. 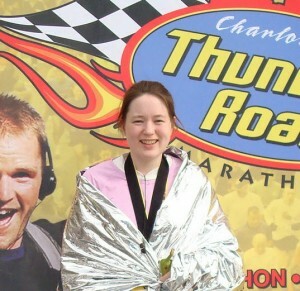 Amber completed her first 5K in April of 2009, and was immediately hooked! A year later she completed her first half-marathon and since then has finished 10 Half-Marathons and 2 Full-Marathons, along with numerous 5K’s, 10K’s, 15K’s, and a 30K. Feeling a need to share what she had learned along her own journey, Amber explored coaching in 2011 when she began coaching a small running group at her office. The desire for running and coaching grew when she joined University Run For Your Life in 2012 as a Coach for Run Fit/Run Fast and later directed the program from March 2013 through March 2014. She is well-respected and recognized as a superior motivator and she will also serve as your biggest cheerleader. She has been on a coaching hiatus since March 2014 and is absolutely STOKED to be back to coach this awesome group. Raised in Raleigh, NC, I moved to Charlotte 15 years ago to finish my college degree at UNC-Charlotte. I have been married for almost 12 years to a wonderful woman who shares my passion for fitness. 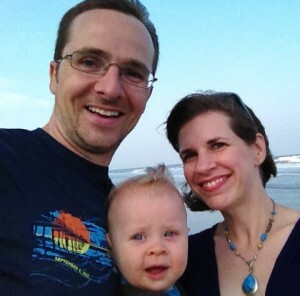 Our family grew in 2011 with the addition of a handsome baby boy. Over the last 10 years, I have completed a number of races ranging from 5k’s to a full marathon. As a USA Fit coach, I would like to help others achieve their goals toward their improved fitness conditioning and completing their 2013 races. Katey is originally from Waterville, NY but moved to Charlotte in 2003. She was a runner in high school but fell out of the sport in college. After moving to Charlotte she found encouragement at work to get back into the sport and found a small group to run with at the gym. From there the distances have grown! Katey’s first marathon was the Thunder Road Marathon in 2009 and she fell in love with the challenge of marathon running ever since. 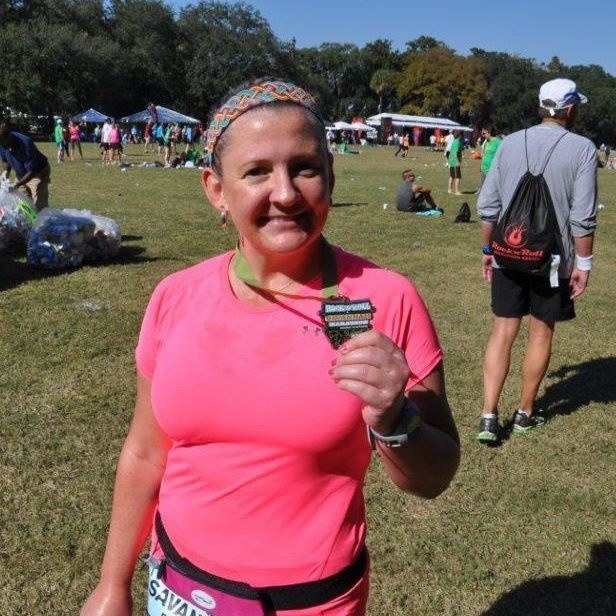 Since starting in 2009 she has completed 5 full marathons and numerous shorter distance races. She is current training for the next step in distance running a 50K trail race in August. Nathan Conklin loves running for exercise, health, camaraderie, to meet new people, and explore new places. He ran as a hobby in graduate school, but then took 10 years off as he climbed the corporate ladder. At the age of 34 he had his second child and realized he was not living a healthy lifestyle. So, he joined the Run For You program and started building a healthy habit. 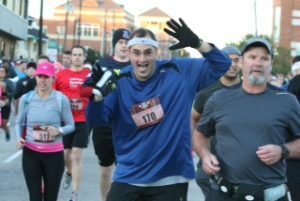 Nathan has run with Run For Your Life groups since 2011 and loves all of the friends that he has made through the RunForYou, USAFit, Run Fit / Run Fast, and the Run Far programs. Nathan’s favorite runs tend to be those mid-distance runs that end up feeling good and turning into opportunities for longer explorations. They include 1) a short route on Hilton Head Island that extended to miles and miles of bike trails, beaches, and sea shells, 2) runs in Central Park, NYC, and 3) new side paths off the University Greenway that most are afraid to explore due to spider webs. Nathan is thrilled to help out coaching and looks forward to helping folks reach new milestones! You might find Nathan out running with his daughter, riding his bike, or a supporting runners while carrying cooler filled with Not Your Father’s Root Beer. However, you can always count on seeing him wearing his sweatband and hearing his “Whoop!” from half a mile away!